Home / 4 Stars / Movie Review / Movie Review: Kung Fu Panda 3 ~Po is back with his gang! Movie Review: Kung Fu Panda 3 ~Po is back with his gang! 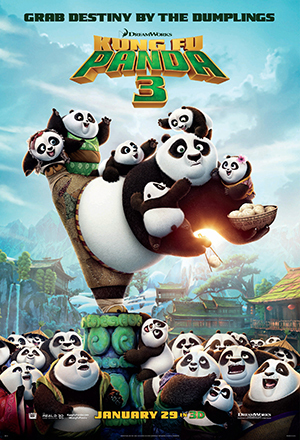 Po, our beloved Panda is back with his antics and underdog heroism in his latest adventure in Kung Fu Panda 3. I have to admit, I have been an avid fan of the Kung Fu Panda franchise movies and dedicatedly watched and re-watched each movie, enjoying it every time and am so happy to say that the third installment is again an entertainer. In this movie, Po is challenged by Kai, a Yak warrior from the spirit world who has come back to our world to rule and the only obstacle in his path is Po, the Dragon Warrior. While strong, Po is no match against Kai's strength and will have to train himself and evoke new hidden powers inside him to battle this new villain. We meet Po's long lost father in this movie and while the movie could have been serious, the makers have succeeded in making this one a funny, entertaining, sometimes emotional, sometimes adorably cute and totally action packed. The movie is not your usual serious superhero flick but made with children in mind so it's never very serious and any somber mood is instantly lightened with a comic event or a cute antic from the characters who are all so memorable that I had them in my mind long after watching the movie. The narrative is strong, the plot well executed and the voices rendered to the characters flawless. Dreamworks have employed their very impressive skills in bringing to us spellbindingly realistic imagery and effects that are memorable and whether you are kid or an adult, you are sure to fall in love with the images. This movie has some impressive 3D effects so I would suggest that you watch it in 3D to get the full impact. All in all, Kung Fu Panda 3 is full of entertainment, fun and promises a time well spent. Suited to both kids and adults, this one is a slightly goofy, sometimes emotional and other times inspiring but always entertaining story of Po, the beloved fat Panda who became the Dragon Warrior but still cant climb steps without panting! 4 out of 5 to it from me. Go watch and enjoy this movie with your family.